I love taking pictures of my food when I eat out. Foodspotting was made for me: social networking around the pictures you take of food. What could be better? Meredith shared this iPhone app with me on the way home from NCTE. She also told me about a new (to me) restaurant. The day after I got home, I was eating at that restaurant and taking pictures of my food for Foodspotting. 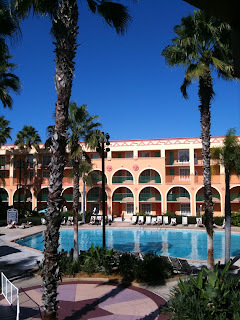 It's hard to believe that a week ago I was in Orlando attending NCTE's Annual Convention. It seems like yesterday, and it seems like it's been months, all rolled into one. There was time Wednesday evening after we got in for my one Disney Experience. I chose Epcot. We rode a few rides, took a brief walking tour of the world, hugged Winnie the Pooh and Tigger, too, and saw the amazing fireworks. Thursday was my Vacation in Florida Experience. I swam laps in an outdoor pool, made some vitamin D the old fashioned way, and caught my breath from the whirlwind week of teaching, grading, and sub plans. More about ART AND MAX here and here. Two of my favorite people to run into in the hallways or in sessions were Amy Ludwig VanDerwater and Heidi Mordhorst. We know each other mostly on our blogs, but it's amazing how well we know each other. Heidi picked right up on my penchant for purple, and I gave her an idea for her next book. Amy and I sat on a bench in the hallway and chatted like sorority sisters. Monday was the Children's Literature Assembly workshop. Now, I know there are some die-hard ALAN fans out there, but CLA puts on a classy workshop for those of us who work with younger readers. The CLA workshop is not about speed and huge boxes of books. There were 5 author/illustrators and we left with a stack of 7 picture books. We heard Doreen Rappaport talk about her recent series of biographies, especially Martin's Big Words and John's Secret Dreams, which were both illustrated by Bryan Collier. Then we got to hear Bryan Collier. After a break, Andrea Davis Pinkney sang to us, and talked about Sit In. After lunch, David Diaz taught us to draw and told us about his process for Me, Frida. We ended the day with a trip to the Mississippi Gulf Coast, led by Hester Bass (she ALSO sang to us! ), who wrote about the artist Walter Anderson in Orbis Pictus winner, The Secret Life of Walter Anderson. Her slide show gave us a peek into the process that E.B. Lewis used to create the amazing illustrations from extensive research and photographs taken on a site visit with Hester. Next year when you are planning your NCTE experience, consider staying on Monday for the CLA Workshop! It is a fabulous, intimate day with children's authors and illustrators. And now it's time for me to get back to my current reality: lesson plans, grading, and an attempt to make my days at NCTE a part of my life in the classroom. I'm reading and listening to ALCHEMY AND MEGGY SWANN by Karen Cushman. (If you follow the link and listen to the sample, you'll hear a description of the house in London where Meggy Swann finds herself delivered, but, unfortunately, you won't get to hear her say,"Ye toads and vipers!") Cushman's newest book is set in London in 1573 "Under the accession of Elizabeth I to the throne of England but afore London's first theater and Shakespeare." All of this is to tell you why, when I began my search for today's poem -- after realizing with a gasp that it is FRIDAY (an aside here about how mixed up I am about what day it is: I keep calling the third day of NCTE Wednesday, even though it was Sunday, just because Monday means "the start of it all" and therefore two days after the start must be Wednesday) ... where was I? Oh. Looking for a poem. So my search turned up the poem by Robert Herrick and it felt like it had been GIVEN to me to share. Maybe even given to me by Meggy Swann herself. Happy Thanksgiving, from my house to yours, and Happy Poetry Friday! Let's meet at Jone's "house" -- Check It Out -- for a feast of poetry! I wouldn't be who I am today as a writer if Philippa Stratton and Bill Varner at Stenhouse hadn't believed in my ability to turn the sketchiest of proposals into a book. I am grateful to Brenda Power for valuing my article-length thinking and writing for Choice Literacy. Thanks to her recent generosity, I now have ideas brewing for several articles about using new technologies in my classroom. 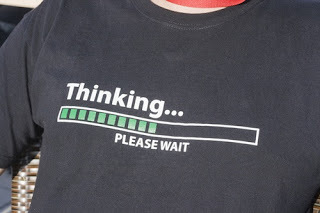 Who pushes my thinking? 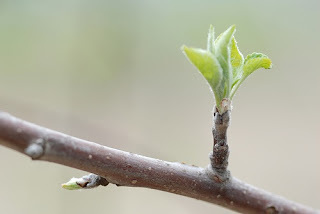 With out a doubt, Franki does, both on the blog and off: about reading and writing and education and baking and the value of Disney in the world (just to mention a few recent topics). Time spent with Meredith always results in new thinking and learning around technology and the arts. And then there are my smart colleagues in Dublin and Central Ohio, my blogging friends from far and near, and Tweet Peeps whose 140 character thinking prods, provokes and amuses. 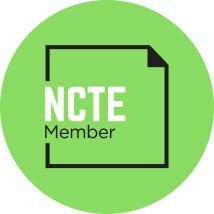 For giving me a leg up and an invitation into the inner workings of NCTE via the suggestion that I apply to be on the NCTE Notable Children's Books in the Language Arts Committee, I am forever thankful to Monica. My life as a professional outside the walls of my building and the boundaries of my district has been forever broadened because of this opportunity. Presenting is pretty awesome, but having the opportunity to lead is even more amazing. Thanks for believing in me, Monica. My life as a professional within the walls of my building has forever been changed by the opportunity to work with the amazing principal, Jeff Reinhard. He leads by example with an attitude of gratitude and an unwavering belief in the teachers and children at our building. He was a gift to us from the universe at the time we most needed him, and we are thankful for every day we work together to find the path to the success we all know we can achieve. The room for ALAN was huge! I think I overheard someone say that 500 people attended. I have been hearing about the ALAN workshop at NCTE for years. It has always sounded like a great day, but I've never been able to attend. This year, listening in on Twitter conversations of @donalynbooks, @ProfessorNana and @PaulWHankins and all of the great YA books they were reading, I realized how behind I was on my YA Reading. So, this year, I attended ALAN for the first time and I think I am addicted. I was excited to see so many authors who write YA as well as middle grade fiction. I knew more of them than I had expected. I have always loved YA literature and today reminded me of that. ALAN (Assembly on Literature for Adolescents) is an assembly of NCTE. Each year, they sponsor a 2-day post-conference workshop featuring YA authors. The day was incredible. I am finally a member of ALAN too and will begin to receive The ALAN Review. James Blasingame, ALAN's president, received several rounds of applause today for all of the work in putting this together. I cannot thank the planning group and the publishers enough for such an amazing day. My 35 pound box of books! My friend told me to arrive early in order to "organize my books". I understood what she meant when I arrived. At 7:30 am, I arrived to a giant (and quite heavy) box of books. At first, I thought about leaving it taped up and opening it when I got home. That thought lasted about 1/10 of a second. I cannot leave books untouched so I opened the box and dug in. Inside were about 40 books of all kinds. Some were books I had heard of. Others were new to me. I looked around to see what others were doing. People had quite a system for organizing their books in front of them. 500 people X 40 books. That is a lot of books thanks to so many generous publishers. I spent about $38 to ship the books home (all but the 4 I couldn't part with). What a great bargain day! I tried to keep count. By mid afternoon, we had heard about 30 authors speak. Authors spoke for 10-15 minutes each and I was amazed at the power of what each said in that amount of time. Each was brilliant and gave such insight into their writing. Following each speaker, a huge line formed at the back of the room for autographing. Anyone that wanted a book autographed could stand in line and quietly wait. From the line, they listened to other authors speak. from one author while listening to another! MARTY MCGUIRE by Kate Messner-Due out May 2011 --(This one is not YA, but I saw Teri Lesesne with it today and took a peak. Looks great for middle grade readers! a website, owned and operated by Twitter Inc., which offers a social networking and microblogging service, enabling its users to send and read other users' messages called tweets. 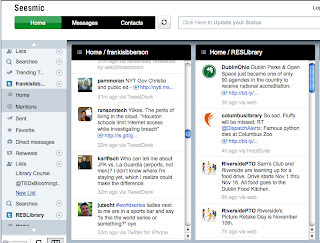 Tweets are text-based posts of up to 140 characters displayed on the user's profile page. My favorite definition is one that I heard from Lee Kolbert in a presentation at November Learning's BLC10. She described Twitter as "The teacher's lounge where you get to decide who gets to come in and who gets to stay." I have been a Twitter user for exactly two years. I began with a Twitter account at an NCTE conference in 2008. My process was a long one and I described it in an article last year. I have built my network and am learning from more and more amazing people. I chronicled my use of Twitter in my early stages in an article for Choice Literacy titled, Addicted to Twitter: How Did It Happen?. Since writing the article, my Twitter group has grown over the last few years and I rely on it consistently. In order to push myself to learn more during this study, I wanted to figure out ways to get more out of the conversations that are happening. Because the list of people I follow has grown, I have no good way to keep up with all of the good information being shared. It is time for me to better organize and take advantage of some of the tools available to help me manage Twitter better. I have listened in on groups talking about "Twitter Conversations", "Book Parties", etc. I could not figure out how those could possibly work when everything seemed so sporadic. 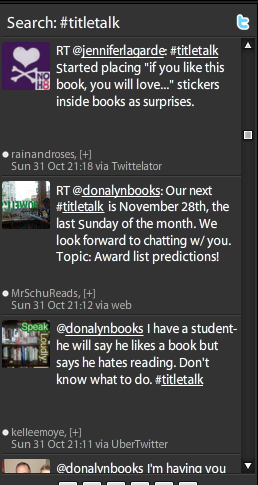 So, I decided to join in on a Twitter Conversation that happens on Sunday evenings called #Titletalk. I learned a lot and was amazed by the depth of conversation. Here is how it works. 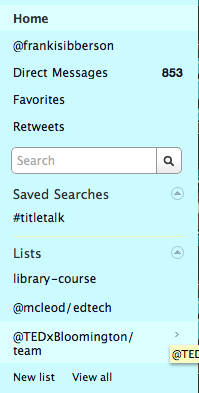 At a certain time (8:00 on Sundays for #Titletalk), people who want to join in, get on Twitter. 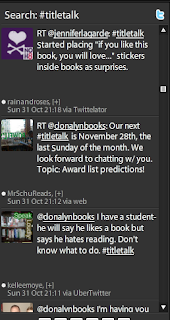 The facilitators, Donalyn Miller (@donalynbooks) and Paul Hankins (@PaulWHankins) usually sends out a tweet with the topic and hashtag (#) prior to the event. The October topic was "Challenges and Successes to Leading Kids to Books." Participants create a search for the hashtag and you can follow the conversation. 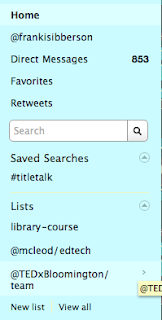 I usually participate via Tweetdeck and the column with the #titletalk search collects the conversation. The key is that participants must hashtag each comment that is part of the conversation. The other part I love about this is that you can revisit the conversation because it is archived on a wiki. The address to the wiki is http://titletalk.wikispaces.com/3+October+31%2C+2010. It is a great resource and a great way to have a more indepth conversation on a particular topic. When I started Twitter, I followed a few people and I added as I found new people who seemed interesting. It was very manageable for a very long time. But then I found that I had to organize my tweets. 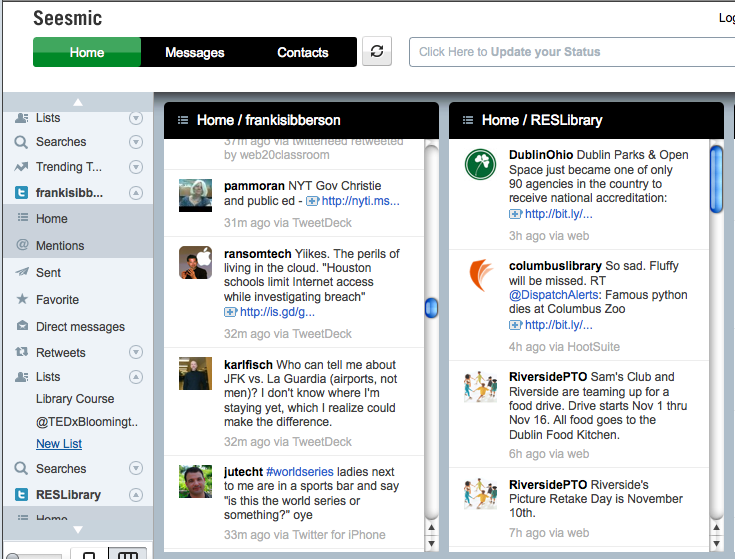 I began to use Tweetdeck a while ago as a way to organize my tweets. Because I didn't always have the time to read tweets from the hundreds of brilliant people I was following, Tweetdeck allowed me to organize the people into categories and my tweets were organized in that way on Tweetdeck. So, I could keep my personal friends from home in one column and librarians in another. I could create as many columns as I needed. This works out most of the time. But when I try to divide my groups into the smaller segments I want, there are too many groups for the column set-up. So I decided to explore the idea of lists. Twitter Lists were launched in 2009 and Josh Catone explains them this way, "They offer a way for you to bunch together other users on Twitter into groups so that you can get an overview of what they’re up to." Creating a list is easy to figure out on your own. 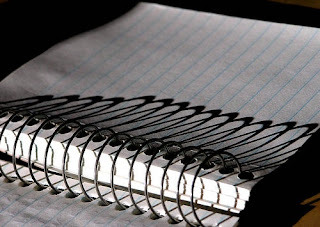 First open the tab that says "Lists" on your Twitter sidebar. Once you get into "Lists", you can then click on "New List" to create a new list. The "New List" feature is at the bottom left. A pop-up window then appears asking you for details about the list such as title, privacy, etc. Then you can add people to your list. 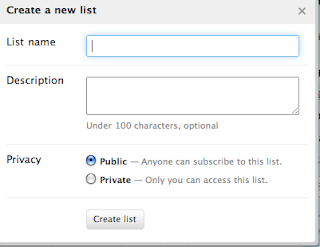 Each list allows you to pull up those people you follow. Twitter Lists is a great feature for me to find what I am looking for now that my Twitter list is so big. 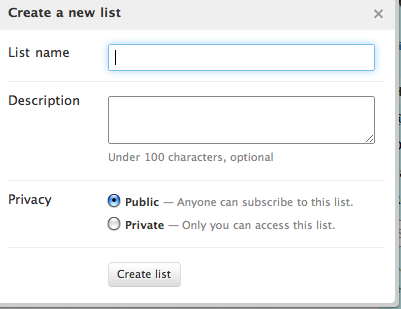 Another feature of lists that I discovered was the ability to follow someone else's lists. I had trouble understanding this idea because it isn't as I first understood it. When I follow someone's list, For example, I began to follow @mcleod's edtech list. I could follow it as its own list or add it as part of a list I've already created. This list does not mean that I am following the people in @mcleod's list. They do not show up in my Twitter feed. But I can have access to their tweets by going to the specific list. Lists are a big "aha" for me. So often, I don't have time to visit Twitter or Tweetdeck in a week and I can't catch up. But there are certain people I follow whose tweets I do not want to miss. I also tend to follow people with various areas of expertise. I follow librarians, technology specialists and children's literature experts. I will be able to think through these people and create lists that help me organize the information. Another big problem I am having with Twitter is organizing my accounts. Because I tweet from 3 separate accounts, I have had to sign in and out to send status updates and to follow others, and to read updates from various followers. A friend told me about a tool called Seesmic. Seesmic is a tool advertised as one to manage social networks. This is a tool that is also available on iPhone and IPad, which is an important feature for me. When you register for Seemic, you can go into settings at any time to add an account. My Seesmic account is then organized with all of the information I need for all of my accounts. I can read status updates from people I follow, create status updates from each account, go to lists, direct messages, mentions, etc. This tool pulls everything together in one place. I can follow all of my Twitter accounts in one place. 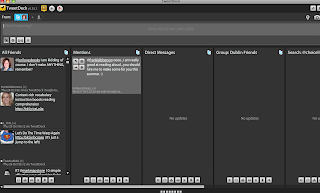 My favorite part of the tool is the ability to create status updates from each account separately in the same box. The box (below) allows you to write a status update and check off the account that you'd like it to be sent from. So, if appropriate, you can tweet it simultaneously from more than one account at the same time. Or you can choose the account that you want the tweet to come from. The box also allows you to add a link, photo, location, etc. so I don't need to have separate Twitpic accounts either. 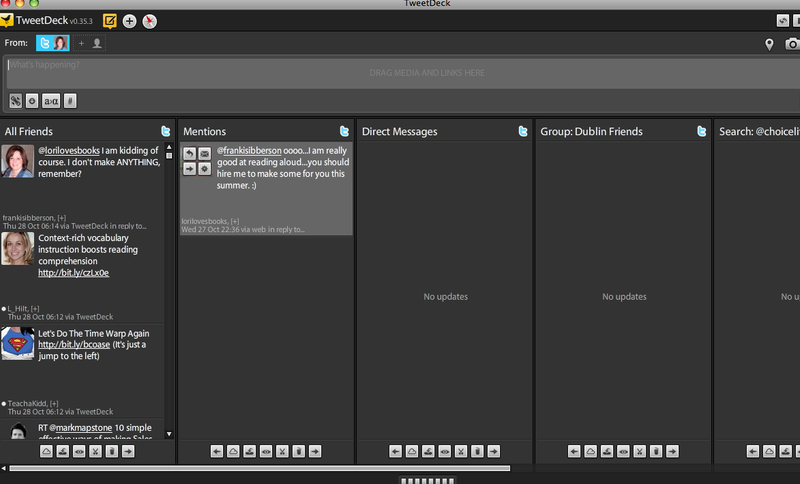 Seesmic allows me to Tweet from each of my 3 accounts in the same box. Twitter is one of the best tools for teachers that I have found. In terms of my own professional growth, I have learned more since I joined Twitter than I have ever learned. I have always participated in professional learning communities but Twitter allows me to expand my professional world and to learn from people anytime. For teachers to use the tool, they have to see the value in it. In order to do that, I have found some resources that will help teachers get started. In my experience, the beginning of Twitter was difficult. I didn't feel like I was part of the conversation and I wasn't sure that I wanted to be. But since then, I have found great resources to support teachers and I am keeping these in my Delicious account so that when teachers are ready, they will have access to the resources. Delicious is starting to feel like a file cabinet to me--for resources for teachers. I really liked Neal Chambers' video called "Twitter Kit". This gives an overview of not only Twitter but how it can help educators. It is a good combination of information discussed in a way that makes sense to people who are not yet part of Twitter. There are a few follow-ups to this first video which are also helpful. There are also people who have collected lists of people to follow. Gwyneth Jones has a newbie-to-follow list as part of her Twitter List page. I also like to take advantage of #FF (Twitter's "Follow Friday") in which people tweet out Twitter handles of people they recommend following. This is another great part of Twitter--sharing networks with others has become part of the Twitterstream. The Twitter4Teachers Wiki is a great resource that is always growing. It is a collection of teachers who tweet and they are organized by field/area of expertise. As I find new areas of interest, I find myself revisiting this site. For teachers new to Twitter, this wiki provides people right away that they can follow--they can begin to customize their list by studying the list and finding people who meet their goals for Twitter us. Everything You Need to Know About Twitter and Tweeting. Although this list provides some ideas for people new to Twitter, this is a good one to have on hand as teachers are looking to move forward with Twitter. What are Libraries Doing on Twitter? "Twitter posts can build relationships with the community and point users in the right direction for more specializd information." I see Twitter as being a great tool for increasing community involvement and for building a relationship with families and the outside community. For me, Twitter has been a key to my professional learning network. I don't know exactly when it happened or how, but I know I am learning more every day than I could ever have imagined. And I am learning from people I never had access to before. Twitter seems to be one of the best ways for educators to begin to create their own network. Says he can't possibly stop. You can't have NCTE at Disney World in Orlando without having at least one magical day before the meetings and sessions start! 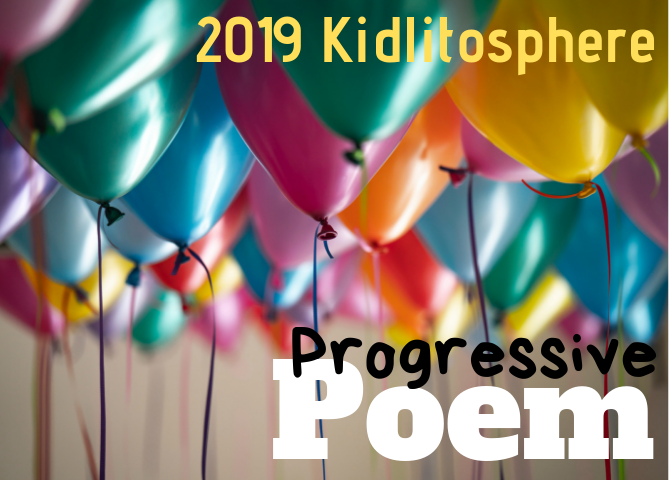 Diane has the Poetry Friday Roundup at Random Noodling today. I added two BINGO games to the library this year-- I SPY BINGO and BINGO LINK. Both are connected to books and are great for supporting visual literacy and vocabulary development with young children. In I SPY BINGO, 4-6 players can play at a time. BINGO cards provide a variety of options for playing but all games focus on beginning sounds and vocabulary development. CAN YOU SEE WHAT I SEE BINGO LINK is a twist on the traditional BINGO game. The "cards" have several photographs (as seen in the CAN YOU SEE WHAT I SEE books). Each card has each photo but they are in different spots. The object of this game is to fill in a "row" of photos from one end of the board to the other. This could be a straight line but it doesn't have to be straight.